Nobody wants to have a missing tooth. A missing tooth is a dazzling smile’s nightmare. However, like it or not, we can have dental emergencies that compromise our pearly whites. But a knocked out tooth or an avulsed tooth, means so much more than just a flaw in your smile. If left unattended, the gap left by the knocked out tooth can develop into other dental issues. Bondi Dental provides 24/7 dental emergency care for you and your loved ones in the Bondi community; the Eastern Suburbs; Sydney and its surrounding areas. If your tooth is accidentally knocked out, your Bondi Dental dentist can help you. There are few important things to remember about this dental emergency. First, you have to visit your dentist within 30 minutes of the injury. The chances of your knocked out tooth being re-implanted lie within these crucial minutes. Second, if the knocked out tooth is a permanent tooth, you can attempt to reinsert it yourself. But if it is a baby tooth, do not reinsert it as this can damage the developing permanent tooth underneath. Only your dentist can determine if the baby tooth can be reimplanted. By 12 or 13 years old, most kids have their complete set of permanent teeth. However, if you are not sure, best let your dentist handle it. Pick it up by the crown and do not touch the root. Handle carefully as damage also can affect the chances of re-implantation. If the tooth is dirty, gently rinse it with lukewarm water for no more than 10 seconds. Do not scrub or rub the tooth. If it is a permanent tooth, reinsert in into place and bite down gently on a clean piece of material to secure it. 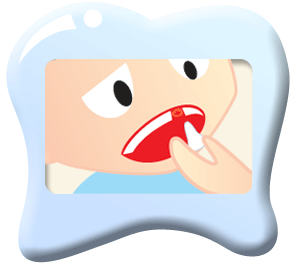 If you can’t reinsert it, soak the tooth in milk, saline solution, or saliva. Go to your dentist within 30 minutes of the emergency. If there is swelling, hold ice over the injured area to reduce blood flow, swelling, and pain. Do this after rinsing your mouth with saltwater solution. Bondi Dental is ready for your dental emergencies 24/7. Rest assured that we’ll treat your dental emergency even after office hours, on weekends (Saturdays and Sundays), and on all Public Holidays. If you have dental emergencies and/or require immediate pain relief, call (02) 9365 7187 to make an appointment with Bondi Dental’s expert dentists.